A few miles south of Manta are a group of little towns each known by the unique wares that set them apart from their neighbors. Unlike the US, where it’s often difficult to distinguish between cities and towns with homogenous strip malls, big box and chain stores, it’s easy enough to pinpoint exactly where you are in this area. Hat Town. Before we even reached our first destination, Montecristi, our friends all but hung their heads out the windows and inhaled deeply because we were passing a coffee roasting plant located off the side of the road. A-w-w-w! 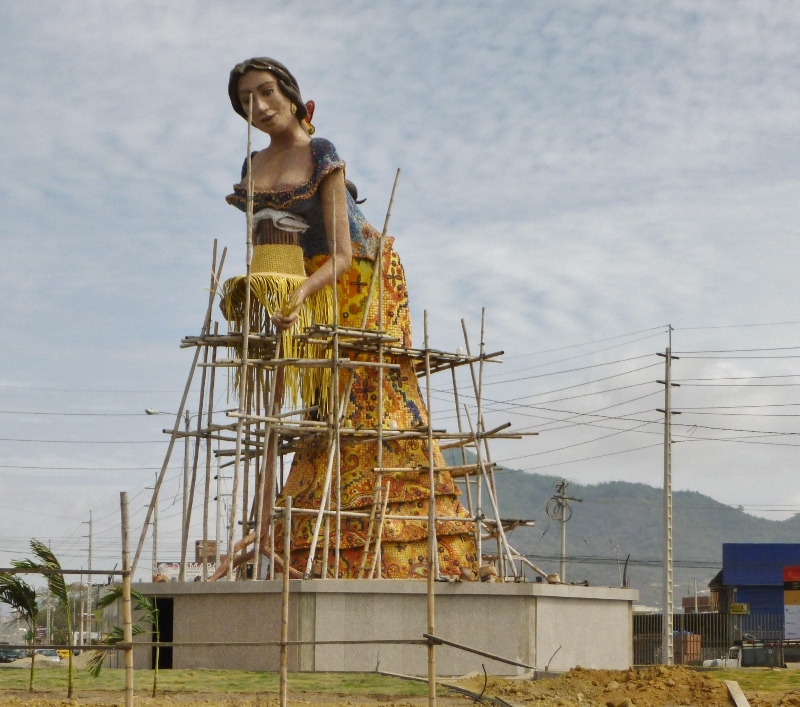 At a round-about, a statue of a woman, at least four stories tall and fashioned from tiles loomed over us, the effect slightly marred by bamboo scaffolding surrounding her for ongoing renovation work. Leaning slightly forward so that we had a view of her subtle smile and generous cleavage and supported by a traditional hat-makers stand, she was engaged in the art of weaving a hat. And not just any hat but the original and misnamed “Panama” hat which was created in Ecuador but became famous when Teddy Roosevelt donned one while viewing the construction of the Panama Canal. The hats woven in Montecristi are an enormous point of pride with their residents because they are said to be of the finest quality. Stores line the streets, displaying not only the hats but beautifully woven hammocks, wickerwork, intricately fashioned straw baskets as well as rustic and good-quality handmade wood furniture. 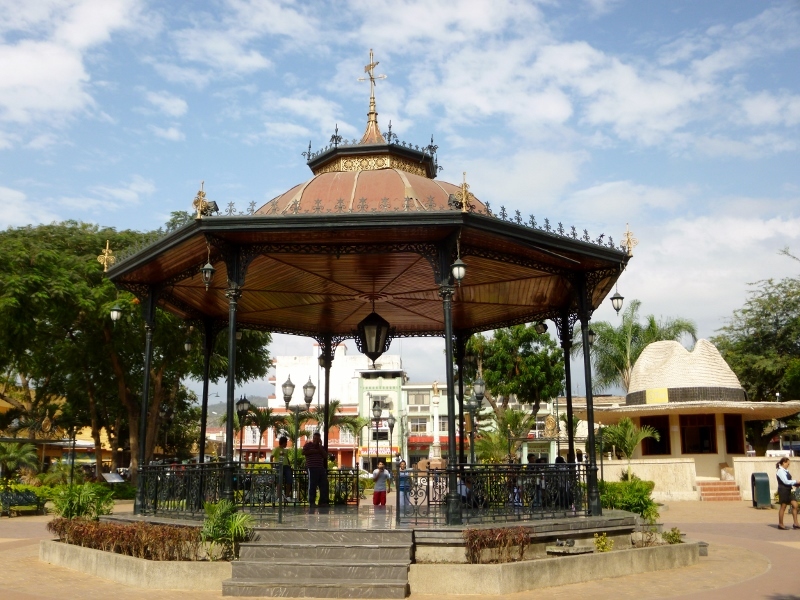 Not to be overshadowed by its famous hats, the colonial city of Montecristi (founded in 1628) is also the birthplace of Eloy Alfaro Delgado (1842-1912), the leader of the Ecuadorian Liberal Revolution. A bronze statue of him resides in the central plaza in front of the elegant cathedral, Nuestra Madre de Monsarrate, alongside a huge and tiled mosaic of Alfaro’s portrait. Statue Town. Upon resuming our journey we came to La Pila, also known to the locals as “Statue Town” for its ceramic statues of imitation pre-Columbian pottery, cherubs, dogs, horse heads, vases and other kitschy bric-a-brac and pottery lining the sidewalks and filling the stores. We stretched our legs and ambled about the displays for a bit, including the unadorned statue of the female potter at work – the city’s totem – but found little to tempt us among the goods. Honey Town. Further down the highway is a wide spot called “Honey Town” where shaded tables display jars, large and small, of various shades of golden honey. We walked among the various stands, smiling at the sellers and, after bargaining a bit, we left with a good-sized jar of Ceibo honey ($8) in which a generous piece of honeycomb was included. In retrospect, the inedible, waxy honeycomb might have been an unwise choice as we could have had more honey! Corn Town. The last pueblo, and most pleasing to the ear, was Jipijapa, traditionally spelled Xipixipa. Pronounced “Hippy-Hoppa,” the mere mention of the name invites a smile. A huge ear of corn, betasseled and partially husked, towers behind a mosaic sign spelling out the town’s name. 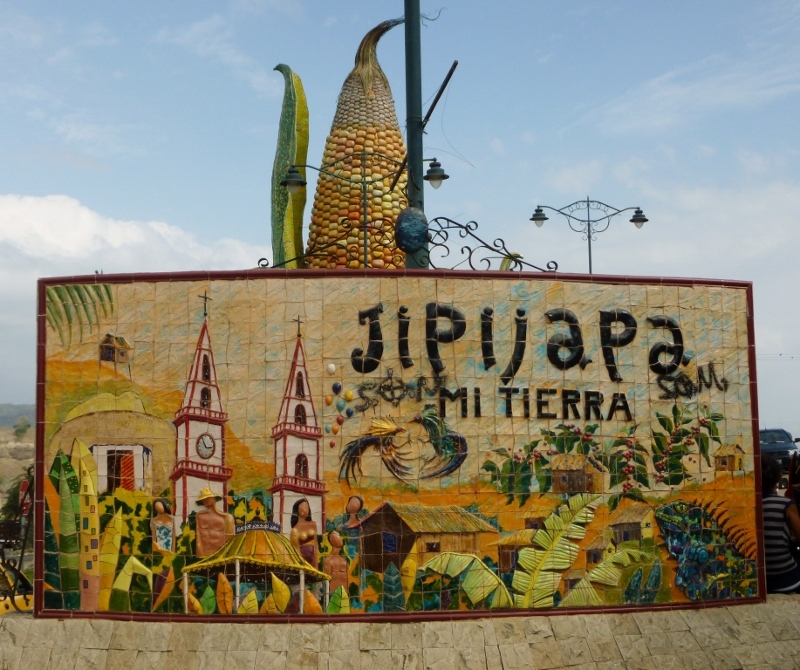 Lore has it that the town’s mayor, at the time of the statue’s conception, wanted a statue that would rival his neighbors; who cares if no corn is grown in or around Jipijapa? 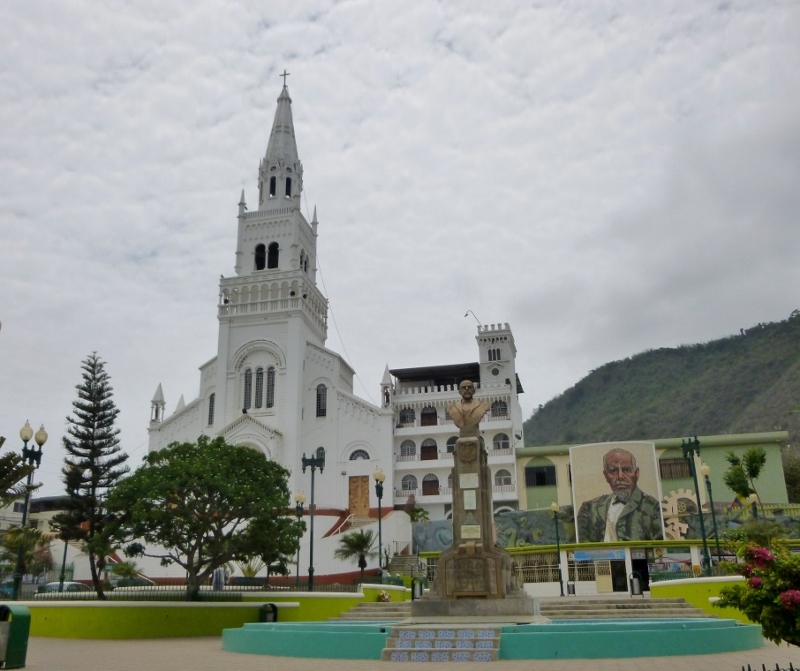 The town serves as a trade center for cocoa, cotton and coffee and, while not a tourist attraction, has a very photogenic Parque Central and the Comunidad Mercedari Catholic Church which is in the process of being repainted. Ceibo Town. Okay, we’re making this one up! 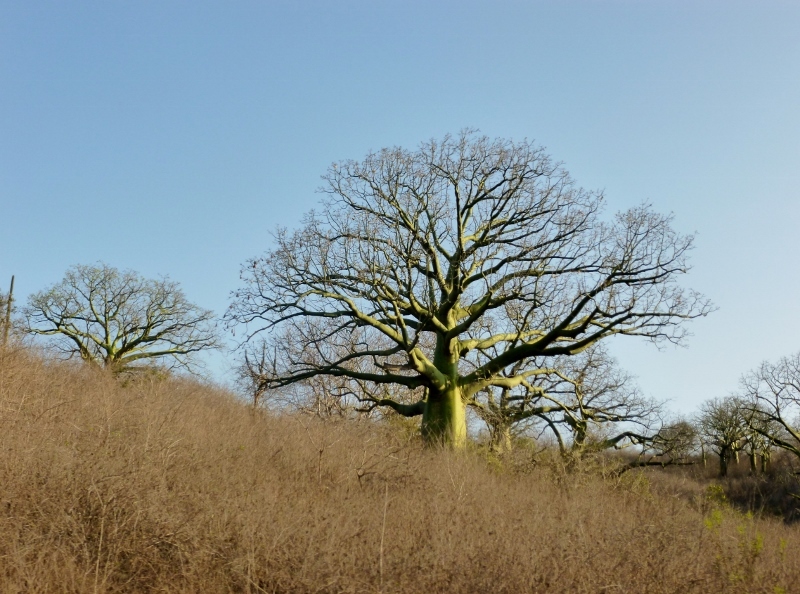 However, these unique trees that are found throughout the area deserve mention. During our journey we saw the Ceibo (Say-BO) trees standing in groups or solitary silhouettes against the skies. It wasn’t hard to understand why ancient people believed they connected earth to the heavens and allowed the ascent of ancient souls. At one time the cotton tufts (kapok) that grew on the trees were used for life vests but now the trees have negligible commercial value and this, along with the old beliefs, may have led to so many of them surviving and flourishing even while much of the land around these trees has been converted to agriculture. The trunks and branches were a bright velvety green and some of the limbs still had last season’s kapok clumps clinging to them. Fascinating post! I don’t know anyone who has visited this area. I love your photos especially the one of the church and the trees. Thanks! A lot of our travel seems to be getting to know a community first and then wandering off the beaten path to explore customs and sights that strike us as unique but are commonplace to the people who live there. Cuenca and Quito get a lot of press because they’re colonial cities but Manta and the area surrounding it has proven to be a gem too! I want to go to Honey Town! I’m obsessed with honeybees and honey is one of the things I collect. Honeycomb is edible and has health benefits similar to pollen and honey. Ever since we met a beekeeper in Utila, in the Bay Islands of Honduras, we’ve had a huge respect for the patience and skill that goes into making honey. Up until then, we didn’t realize that each region produces honey with subtle differences and all the things that can be made using the wax from the comb. And the health benefits are numerous! What an interesting article, I haven’t been to Ecuador in many year, and I certainly didn’t know this side of it! Thank you for sharing. Ecuador is a country with so many different facets and, indeed, with the huge contrast between coastal cities and rural towns and colonial cities high in the Andes it would be hard to get a sense of the whole country without spending years exploring it. You’ll have to come back for another visit! Ecuador seems to have a lot going on! Beautiful and quirky all at the same time. Thanks for the heads-up on Puerto Cayo! The towns and countryside around Manta change so quickly from amazing beaches and bluffs to arid countryside or green rolling hills. Every direction and most towns seem to have something that sets them apart and Ecuador may very well be that place that offers something for everyone! Such an interesting post with so many different facets. 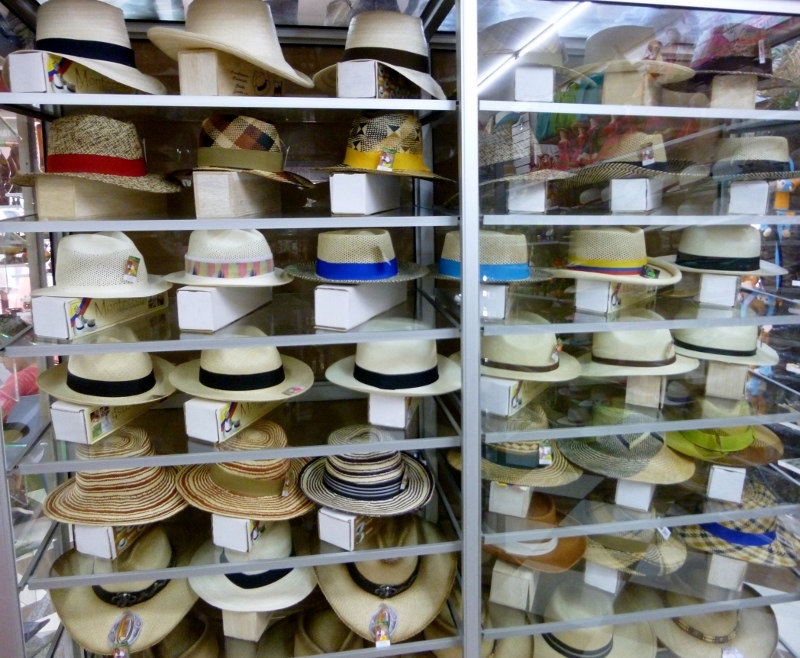 I loved the snippets about the Panama hats (and would have a hard time choosing! ), and also about the Kapok trees and the stories behind them. But overall so many things I just didn’t know. We first found out about the origin of Panama hats in Mexico when we bought our sisal ones a couple of years ago. 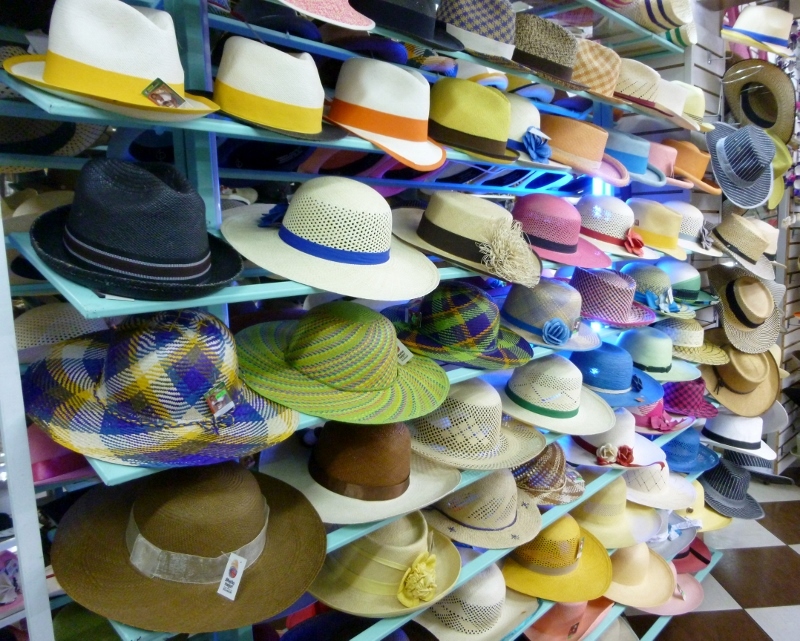 The hats in the Montecristi stores and sold throughout the region vary in color and style and we were both tempted to pick up new ones. However, when we buy something we have to leave something behind and our old battered hats still have some good wear! I couldn’t imagine what Snow White was doing with what I thought was pasta. What a fun welcome to Montecrisiti and interesting town by town discovery. I loved the craftsmanship on the corn statue, and the Ceibo trees-wow on the color! We were in Montecristi again yesterday to join friends for lunch and we checked out the hat lady again. If you didn’t know what she was doing she could be Snow White dangling pasta! The scaffolding is gone now and she’s restored to her former glory (and open to more speculation about what the heck she’s doing)! The Ceibo trees are amazing. Guessing that at some time they must have leaves. Very interesting. Some of the ceibos were just starting to grow leaves for the next season and, after checking with the definitive online source Wikipedia (ha ha!) the pictures show that they really leaf out which would obscure their elegant branch structure. What a colorful group of cities! The cities were fun to explore and we loved the idea that each one had one unique feature that set it apart. No big box and chain stores around here! My favorite image is of the Snow While-like statue at the top. Montecristi is an interesting town. I hadn’t noticed the resemblance to Snow White until you pointed it out but you’re right. She’d be wise to don a hat under this relentless equatorial sun! Montecristi looks like a town worthy of some exploration. 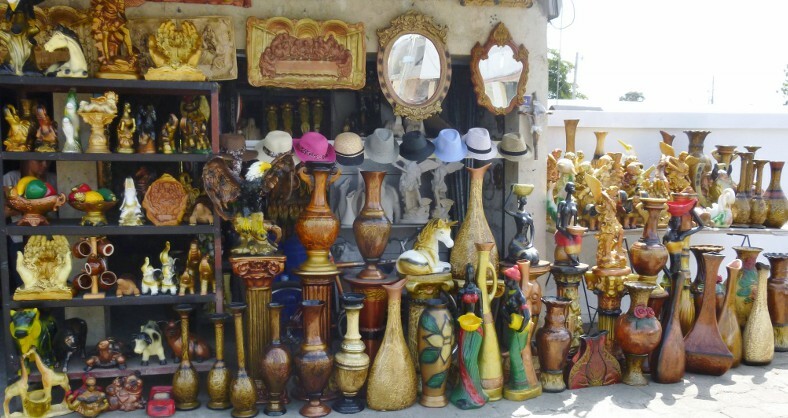 Montecristi is a fun little town to walk around and bargain for some beautiful handicrafts. It’s a pretty steep hike to the cathedral at the top of the hill but, once you’ve worked up an appetite, there are several great places to eat too.. Loved this! I cracked up at the “cleavage”. You never see that in the United States. I am totally into the Panama Hat and I just assumed it was named after Panama. The ones in your photo are so beautiful. I have found that traveling with a hat is challenging, they get squished quite easily. She does give a new meaning to “welcome!” As for the hats – we were told that the more expensive Montecristi hats could be rolled and packed. We bought “Panama” hats in Merida, Mexico that are made of sisal 2 years ago and rolling them before packing works great! The quality is worth it because, even though they’re less white and somewhat battered, they still look pretty stylish! Love the diversity of the towns and your photos show them off to great effect. I’d definitely be pulling over for some honey and those trees could keep a photographer happy for hours. Thank you. Each of the towns was unique and proud of what set them apart; it was fun to explore around and about. And the trees… when we first saw them we were both awestruck and yes, we took a lot of photos. 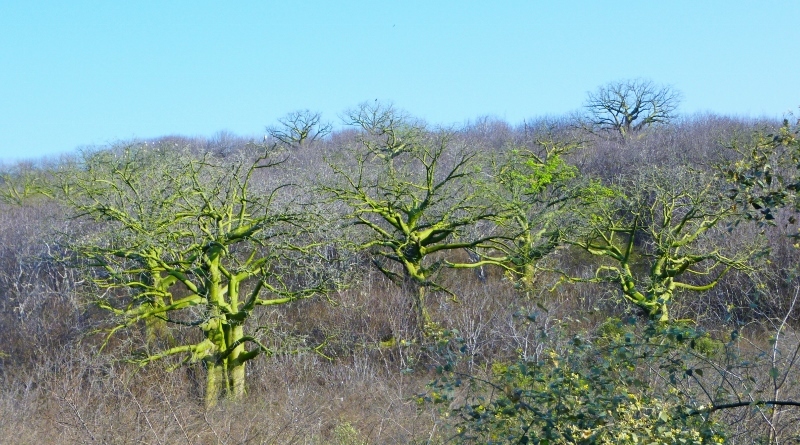 Like the towns, each tree is exceptional! These towns are so interesting and colourful. I like the looks of the ceibo trees – something compelling about them. As I think you can tell, we’re drawn to color – the brighter and more dramatic the better! And the towns with the unusual statues really stand out for us westerners when, so many times, there’s no way to tell where one town ends and another begins. You’re right about the temptation of wanting to pick up handcrafted items along the way! We’ve ended up purchasing “useful” souvenirs that take up little room like a woven or embroidered bag here and there to help organize or a light scarf for evening. We compensate by taking lots of pictures that only take up digital space. The “Panama” hats of Montecristi were gorgeous but we bought ours, woven from sisal, a couple of years ago in Merida, MX. Battered but still useful! Oh, this is so much fun reliving our trip through Ecuador in May. How did you travel up the coast? Did you rent a car? We took buses up and down the coast. I wanted to stop at Honey town, but we couldn’t. 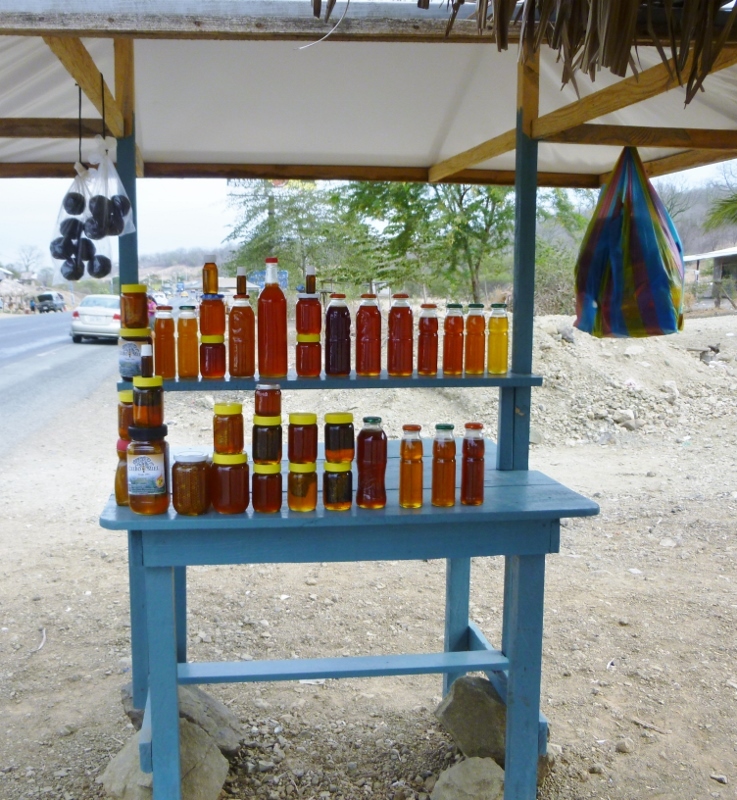 There were so many honey stands. Those Ceibo trees are like something out of the Wizard of Oz. They are magical and I could imagine that they were dancing and talking with each other. Thanks for the memories. Like you, we loved this area and were fortunate to explore the area twice with separate groups of friends in their cars which gave us a lot more freedom than a bus. No problem to stop at Honey Town or the multiple times we pulled off the road to take photos of the Ceibos. We have to agree with you that they are magical – it’s easy to imagine a face on each one of them! Wow, thanks for introducing so many special items that represent each town’s icon. Did you buy them for souvenirs? So many souvenirs, so little room… This is a huge temptation for perpetual travelers! We found a great deck of souvenir cards with beautiful photos of the Manabí province to remind us of each little town so I’ll leave our old deck of cards behind. A good way to remember our visit! So glad you liked the post, Cindy! Gorgeous photos! Thanks for sharing, makes me want to make the trip! Becoming a “virtual traveler” is one of the things I like most about reading other travel blogs. It’s a terrific way to learn about new areas with some personal impressions that always add to the story. Great post. Love all the towns and photos. Did you buy a Panama hat? I enjoy following you and getting ready to see all this in a couple of years. Were you on a tour of these places or out on your own? Vaya con Dios. Thanks, Suzi. We were tempted, of course, to replace our battered old “Panama” hats that we bought in the Yucatan a couple of years ago. However, our old hats roll up and can be reshaped when we unpack since they’re made out of sisal. While they’re a little worse for wear, I’d hate to subject one of the pristine Montecristi hats to our treatment! As for transportation, we were lucky enough to make two separate trips to the area with new expat friends who wanted to explore the area, too. A car makes the logistics a lot easier, doesn’t it? Yes having a car is easier but the adventure of finding our way around without a car is fun too. We sometimes get a car for a day or two to get our bearings but never for very long. You’re right. On a practical note, I’d pick a bus over me driving anytime in places where I can’t figure out the local traffic rules! Heehee!